Photo editing apps are starting to get a little crowded, but Photobucket thinks they have something unique with the new Snapbucket app that just became available in the Android Market. Snapbucket is a separate app and complements the currently offered Photobucket app. With Snapbucket, users can snap a photo and apply various filters, vignettes, and frames to it. You can immediately share your edited photos on Facebook, Twitter, or your Photobucket albums. You can even create your own filter sets. * “Retro,” “Lomo,” “Sunrise,” and “’70s” – just a few of the awesome sets you can use to style your photos. * Over 9500 combinations of sets are available, many more than Instagram, Hipstamatic, Vignette or PicPlz! 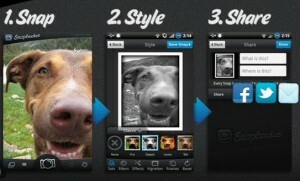 * Choose from individual filters, effects, vignettes, and frames to style your photos your way. * Create YOUR OWN unique filter sets and brag about them to friends. * Show off your stylin’ skills by sharing with friends to Photobucket, Facebook, or Twitter. * Unlock new effects the more you use Snapbucket, and get filters that’ll make your friends green with envy! * We’ll always keep your original photo safe on Photobucket, so don’t worry – go crazy with styling! Your original and edited photos will be stored in your Photobucket account. Photobucket is hoping that unlimited storage on the go will sway customers from competing apps to Snapbucket, not to mention there is already about 100 million Photobucket users. Snapbucket is available now in the Android Market and is free. For the QR code please see our apps database or to go directly to the market, please hit the source link. Next articleNexus T Toshiba Tablet Next Official Google Release?